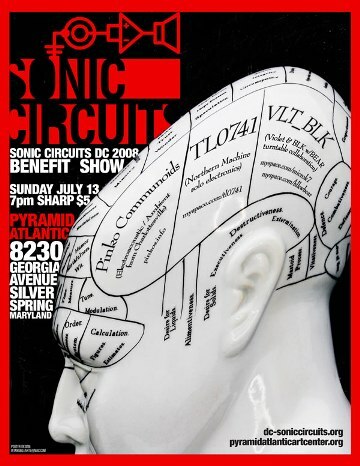 The Sonic Circuits Festival of Experimental Music was initiated by the American Composers Forum (ACF) to provide Washington DC's music and art communities with the opportunity to sample experimental and avant-garde electronic music, with an emphasis on improvisation and artistic use of new technologies. Now heading into its eighth year, the Washington DC chapter of the ACF has expanded the scope of the festival to include electroacoustic compositions, experimental jazz, noise rock, electronic drone and experimental folk, as well as live video and film programs. Sonic Circuits seeks to foster the spirit of collaboration through the diversity of participating artists, and its varied programming appeals to arts enthusiasts of all types. The 2008 Sonic Circuits Festival is scheduled for September 28 through October 5 at the Velvet Lounge, National Museum of Women in the Arts and George Washington University in Washington DC, and at Pyramid Atlantic in Silver Spring MD.